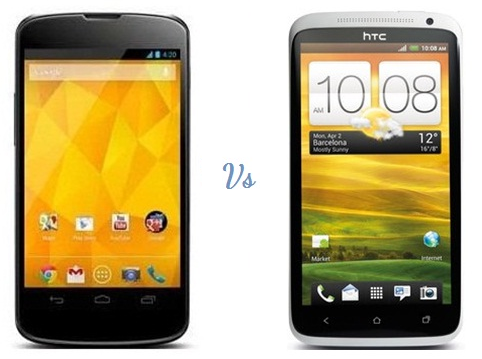 The HTC One S or the Google Nexus 4 - Which one is right for me? The HTC One S or the Google Nexus 4 – Which one is right for me? What does one expect from a smart phone – features like top notch hardware, design, multimedia compatibility, software, and a robust connectivity featuring a superb processor to run it all. Yes, the phone also has to be app friendly, have a huge display, and have a stylish design, making it perfect for those from all walks of life. What if you have a limited budget but still are looking for a wonderful smart phone with multiple features intact? Your answer would be to choose between the HTC One S and the Google Nexus 4. Though the flagship model of HTC is the HTC One X, we feel buying the HTC One S is a wiser choice thanks to better software and a robust design for a lesser price. Although the HTC One S does not feature a quad processor, it still is a notch faster than the One X model that has a dynamic processor. The expandable memory is only up to 16 GB, making it difficult for you to store a lot of information in the phone. However, that shouldn’t be a problem today as there are many cloud computing services and online document directories available for you with unlimited space. The camera of the HTC is 8 Megapixel resolution-enabled with several photo modes available for you to use. The mobile is powered with Android 4.0 and is app-friendly and syncs with ease. Therefore, whether you use it for corporate purposes or for fun, the HTC One S is a good toy to have. The battery could do with an upgrade, however. All in all, the HTC One S is good value for money. Partnering with LG, the Google Nexus 4 is a bold venture by Google, which has not been as successful as its earlier association with HTC and Samsung, but still it manages to pack a solid punch. Whether it is the super-slim model, the robust design, or the complete metal pack, the Google Nexus 4 features top notch build quality in the fragile smart phone niche. You might be left wondering why Google would want to sell the Nexus 4 for such low prices, but then isn’t that great for people who have little to spend, and yet, are looking for a smart phone? Though the Nexus 4 is meant to be a budget phone, the hardware is superb and has a quad-core processor and a RAM of 2GB. The memory is expandable up to 32 GB and that is another solid stat in our books. With excellent networking, connectivity, and syncing facilities, the Nexus 4 is compatible with 3G networking plans and we hope the model launches a 4G pack too, hopefully, by next year. The HTC One S and the Google Nexus 4 are both unique high end smart phones sold for surprisingly low prices. They are therefore, the ultimate dream budget smart phones you would want to have. Of course, they aren’t jam-packed full of goodies like their Samsung and Apple counterparts. But what they offer you for the price you pay is good – in fact, very good. Phil Turner has been checking Orange deals on smartphone recently and is trying to make a decision.